Housing is already a major issue for the Bay Area's economically vulnerable. Now, the rising sea level is compounding worries about environmental contamination and housing scarcity. Along the San Rafael canal in Marin County, yacht clubs catering to the well-to-do stand cheek by jowl with working-class housing. On the canal’s south side, a squat, crowded apartment complex juts out, a mini-peninsula surrounded on three sides by blue water. Little more than a creaky wooden deck and some thin walls stand between these renters and a bay already swollen with tides and storms. Sea level rise is changing Bay Area shorelines, and the focus of planning discussions on mitigating the effects suggests most communities in the water’s way have time to adapt. But it doesn’t always feel that way in East Oakland or West Marin. For the Bay Area’s most economically vulnerable residents, many of whom are people of color, sea level rise is a threat multiplier, worsening existing concerns about environmental contamination and housing scarcity. “When it comes to sea level rise, our first concern is: Are we even going to be here?” says Marquita Price, a community organizer with the East Oakland Collective, which focuses on underserved communities. Rising rent, she says, is a tide rolling through her neighborhood faster than the bay’s waters. But among her friends and neighbors in historically black East Oakland, Price says, disastrous events have increased awareness of the risks posed by climate change. “There are almost indefensible conditions there, and they need a new way of thinking about it,” says Marcel Wilson, referring to the apartment complex precariously close to the San Rafael Canal. Wilson’s a founder of San Francisco-based Bionic, a landscape architecture and urban planning firm. He led a team focused on the canal neighborhood for the recent Resilient By Design competition, an effort to develop strategies against sea level rise, sponsored by the Rockefeller Foundation. Wilson’s team of urban designers suggests pulling back from the mudflats, relying less on the pump-and-levee infrastructure that secures east Marin, and putting taller buildings on higher ground. The Bionic design promotes “multiple lines of defense,” meaning as waters rise, people could retreat behind layers of protection, including an elevated Bay Trail, earthen levees, raised roads and an improved drainage system. That strategy would protect the neighborhood community center, among other structures; if waters rose further, a sports field could serve as a retention pond to control flooding. But that’s a huge project, and neither money nor a plan currently exists to implement this kind of redesign. “It would be very expensive to build something or improve something this big in the community to protect the families from sea level rise,” says Douglas Mundo, the co-director of Shore Up Marin. 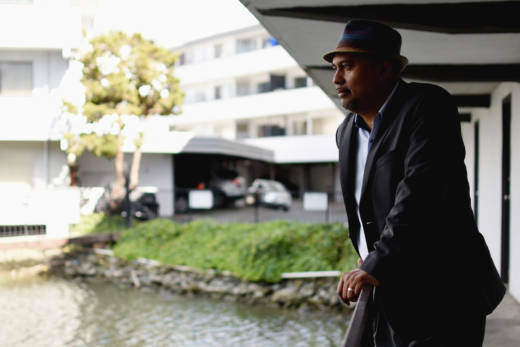 In east San Rafael, where individual incomes average one-third of Marin County's, intermittent flooding already threatens cars parked on the street, preventing residents like Juan Antonio Morales from going to work. Morales doesn’t want to move. He has lived in Marin County for 30 years. His children play here; he’s close to his neighbors. Besides, he says, he can’t imagine where else he could afford to keep a roof over his head. Moos Thompson met with people like Maria Sanchez, who worries about getting stuck in housing already at risk for flooding. 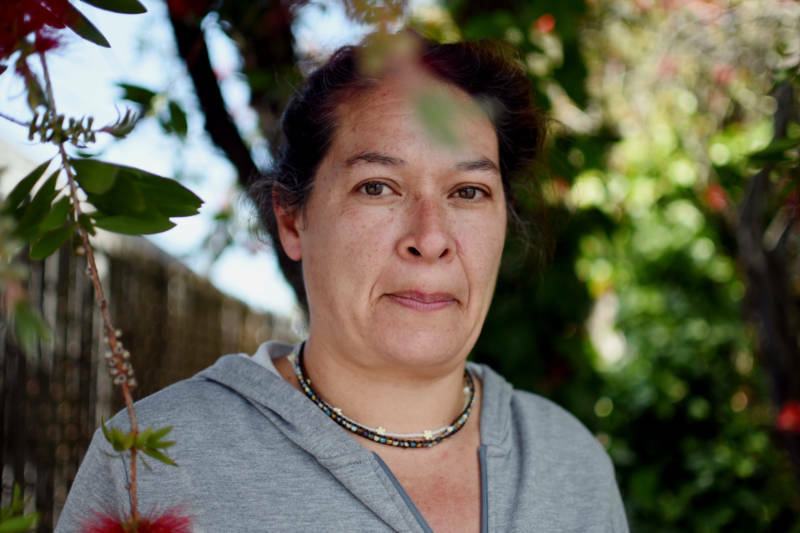 A single mother, she works seven days a week as a cleaner. There’s no time for going to public meetings or lobbying local officials for help. Sanchez is scared rising seas will eliminate affordable housing and price her out of the market. "It is going to affect me a lot, 100 percent," Sanchez says. "Because if I already work seven days to survive, I don’t know what I’m going to do. Yellow gumplant and white clover bloom along the Martin Luther King Shoreline, not far from the Oakland Coliseum. It’s beautiful, but underneath and across East Oakland, like the bay, groundwater is rising. As it does, it carries industrial pollution up through soil and mud. “We can't pump and just build walls to keep it out,” says UC Berkeley professor and urban ecologist Kristina Hill. Hill and graduate student Ellen Plane have used groundwater wells to map the rising toxic plumes under the surface of the city and the shoreline. Contamination in soil and groundwater won’t be stopped by a wall, they point out. The East Oakland Collective’s Marquita Price says she values this research, and the work of Janette Kim, a California College of the Arts architectural designer who helped design a sea level rise adaptation game for community engagement. Hill, Kim and their students are the All Bay Collective, a Resilient By Design team proposing a project called the Estuary Commons. But Price remains skeptical of efforts to adapt to climate change along the East Bay’s shoreline. She questions whether the big international teams did enough to incorporate local perspectives in the design process. UC Berkeley professor Kristina Hill says she understands Price’s objections. But she wants to encourage the public, officials, and agencies to think big to address the intersecting challenges presented by the combination of toxic water, rising seas and scarce housing. 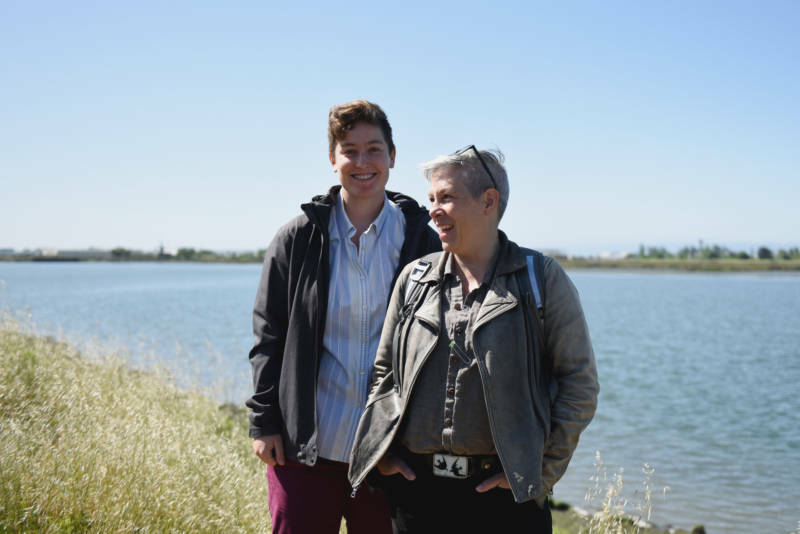 Hill advocates for digging out and treating contaminated soil, then using it to shape a ring of marsh and tidal lands between Oakland and Alameda. People could then live on the land, which would be managed and owned by a community land trust. Her ideas for the Resilient by Design project, Estuary Commons, are beyond ambitious. They would require unprecedented cooperation among multiple layers of government, significant financial investment, and a collective re-imagination of property rights, financial risk and the shape and purpose of the shoreline itself. But none of that dissuades Hill, who points out that we’ve changed the bay before, moving creeks that feed it, or building out shorelines. Hill says those mistakes involved ignoring the connection between communities and land, and pushing water away from the shore. Around the Bay Area, Hill says, building a better relationship with rising water isn’t optional. Neither is addressing problems lingering in our communities, on land. “It’s our survival,” Hill says.